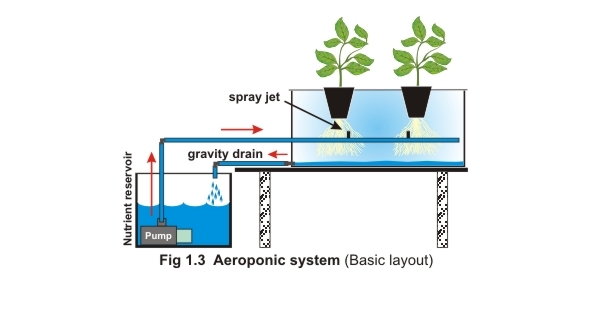 Aeroponic systems require no media (Fig 1.3). 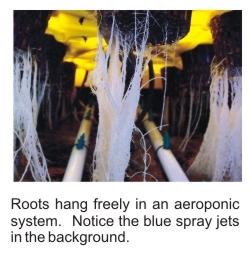 The plant’s root system is freely suspended in a well ventilated reservoir. The nutrient is delivered as a fine mist or fog via the use of spray jets and a high pressure pump. This typically operates 24 hours per day. ● Provides an oxygen rich environment for roots. ● Avoids the supply, disposal and cost problems associated with medium based systems. ● It is easy to disinfect roots and hardware. ● The absence of medium makes it easy to inspect roots for signs of disease and feed adequacy. ● Root zone EC and pH will equal that of the nutrient solution. ● Spray jets are prone to blockages therefore filters and routine maintenance of the feed circuit are necessary. ● Evaporation losses are high and unless the nutrient is replaced frequently, salt build-up can be rapid.